The perfect addition to one of our Fuel Rail Adapters or Fuel Blocks with 1/8" NPT ports. 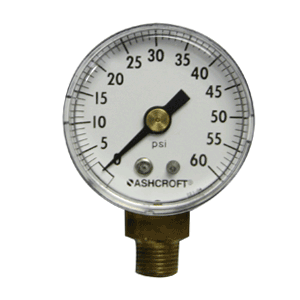 Monitor your fuel pressure while under the hood to diagnose problems or set fuel pressure. Can also fit the stock shrader valve with a 1/16"NPT to 1/8"NPT adapter. Quality Construction: Features an 1/8" NPT male connection fitting and built in a steel case, brass socket and Polycarbonate window. No one gives you the bold clean styling of our Aftermarket Dress Ups, Suspension and Performance Parts for your American Muscle Car like UPR Products! Installs in 5 minutes or less. Fits these Vehicles: 1986 1987 1988 1989 1990 1991 1992 1993 1994 1995 1996 1997 1998 1999 2000 2001 2002 2003 2004 2005 2006 2007 2008 2009 2010 GT Cobra Bullitt Mach 1 Shelby Mustang Steeda Roush & Saleen Vehicles.